DESTEK,a blending word of Design and Technology, comes from imagination and creativity, bringing joy into your life. DESTEK endows products with a sense of design and technical spirit, conveying our pursuit of life. DESTEK V2 VR Headset, your best choice to enjoy the stunning VR world! 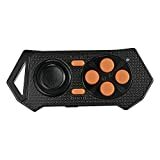 Awsome VR Game Partner : The bluetooth remote can do player control (play/pause, volume+/-, back) and game control, fits IOS (< IOS 9.4) and android. Compatible with lots of VR games in Google Play like End Space VR; Hardcode VR game; Invasion VR 3D Demo; Shadowgun VR; Smash VR etc. NOTE: Game control ONLY for Android; remote can work with Gear VR. Best Movie VR Clear image High-quality lens with high light-transimission makes the image clear, exactly renewing movie scenes while disspating eye fatigue; object/pupil distance adjustments make it suitable for different people Less image noise Most suitable FOV for movie watching. 83° FOV makes whole image brought out with less noise caused by image magnifying Comfortable wearing Flexible velcro straps and high-quality PU facial pad make it cosy to wear. Awesome Front Cover Design The removable front cover is better for heat dissipation while holes on the cover make it better for AR or camera shooting purose. Note: This VR is not suitable for users with over 200° of myopia. NO NFC tag. PACKAGE VR Glass, Bluetooth remote, User Manual, Cleaning Cloth, Pads Confident to choose DESTEK Customers come first with friendly and fast customer service. 12-month warranty for each DESTEK product sold from Thinkline LLC-only OWNER of DESTEK Trademark. Long-time reliable support from DESTEK forum. Your smile is what we are pursuing. Instead of money, we care more about your feelings. Any questions, please feel free to contact us. DESTEK,a blending word of Design and Technology,which comes from imagination and creativity,bringing joy into your life.DESTEK endows products with a sense of design and technical spirit,conveying our pursuit of life. We believe that the next million virtual reality experiences will happen over the world.Now!DESTEK already created the VR glasses just play with smartphone into virtual reality.More than 300 Virtual Reality apps in Google Play store&Apple App store updated,just download"VR games"apps&"3D split screen"videos to your smartphone to enjoy immersive & exciting VR world in cost-effective easy way. Only care Heath of your eyes DESTEK VR lensesdo the least harm to your eyes in the current market with FOV 90. 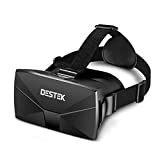 DESTEK spends many time testing the better distance for watching 3D movie & playing game healthly.Our lenses have reasonable focal length,so no optical lenses adjustment needed. 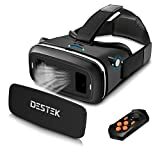 Special offers buy DESTEK Vone 3D VR Headset can get DEESTEK Bluetooth Remote at $8.99. The remote not only interacts with your Android smartphone smoothly, it can used as air mouse for TV box & Laptop,PPT ect. Humanized Design ? Humanized material,high quality breathable & comfortable but Non-toxic environmental sponge to protect your face. ? DESTEK uses a magnetic clasp to keep the lid closed. Nice to open and close and quite secure! An additional thiner holding phone sponge pad is available for thicker phones like Note2/3 etc. ? 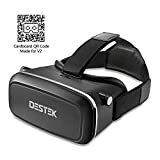 DESTEK 3D VR Headset Derives from Google Cardboard,NO MAGNET BOTTON. 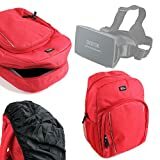 Package VR Glasses,NFC,Nose Pads,Cloth,Manual. Confident to select DESTEK: Friendly and fast customer service. 1-year warranty for each DESTEK product sold from Thinkline LLC--the ONLY OWNER of DESTEK Trademark. Your smile is the goal we are pursuing. Instead of money, we care more about your feelings. Please feel free to contact us. DESTEK,a blending word of Design and Technology, comes from imagination and creativity, bringing joy into your life. DESTEK endows products with a sense of design and technical spirit, conveying our pursuit of life. DESTEK V2 VR Headset, your best choice to enjoy the stunning VR world. Awesome VR Game Partner The bluetooth remote can do player control (play/pause, volume, back) and game control, fits IOS (< IOS 9.4) and android. Compatible with lots of VR games in Google Play like End Space VR; Hardcode VR game; Invasion VR 3D Demo; Shadowgun VR; Smash VR etc. NOTE: Game control ONLY for Android; remote can work with Gear VR. 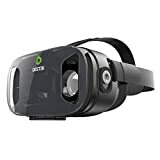 Best Movie VR Clear image High-quality lens with high light-transimission makes images clearest, exactly renewing movie scenes while disspating eye fatigue; object/pupil distance adjustments make it suitable for different people Less image noise Most suitable FOV for movie watching. 83 degree FOV makes whole image brought out with less noise caused by image magnifying Comfortable wearing Flexible velcro straps and high-quality PU facial pad make it cosy to wear. Awesome Front Cover Design The removable front cover is better for heat dissipation while holes on the cover make it better camera shooting purose. Note: This headset is not suitable for users with over 200 degree of myoipa PACKAGE VR Glass, Bluetooth remote, User Manual, Cleaning Cloth, Pads Confident to choose DESTEK Friendly and fast customer service witnin 24 hours. 12-month aftermarket support for each DESTEK product sold from Thinkline LLC, the only OWNER of DESTEK Trademark. Long-time reliable support from DESTEK forum. Your smile is what we are pursuing. Instead of money, we care more about your feelings. Any questions, please don't hesitate to contact us. Introducing DURAGADGET's brand new and exclusive, premium quality rucksack for your VR Headset, finished in an exciting Camouflage. Crafted with an impact-resistant, shock-absorbing nylon exterior shell and featuring a soft, padded, water-resistant lining, this case will provide intense protection for your device - we've even included a secure rain cover with this backpack, allowing you to transport your headset with you between locations even in the worst weather! The case features wrap-around dual zip closures on the main compartment and the front pocket, lending extra security and endeavouring to ensure that your device is kept dust and scratch-free. Several padded partitions within the case can be adjusted and arranged using strong Velcro strips to meet your specific storage requirements - provide a safe and snug fit for your new VR Headset, guarding it from knocks and bumps! With fully-adjustable shoulder straps that are designed with padding for comfort, and an additional carrying handle, the case provides versatility and choice in the transportation of your gadget and all it's corresponding accessories. This unique, compartmentalized case management solution offers multiple inner netted zip compartments too, to allow the option of keeping your accessories close-by at all times, such as batteries, charger, etc. DIMENSIONS: Height: 300mm x Width: 240mm x Depth: 110mm. DESTEK,a blending word of Design and Technology, comes from imagination and creativity, bringing joy into your life. DESTEK endows products with a sense of design and technical spirit, conveying our pursuit of life. 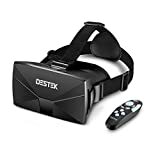 DESTEK new generation VR headset makes you experience the VR world more immersively, perfectly achieving the interaction between you and the VR world. Short-focus lens & Large FOV-Stronger Immersion The short-focus lens deeply magnify the image, making it closer to you; the 103 degree FOV makes the image fully displayed within the real sensilble view of the eyes, letting you enjoy the VR world more immersively. Magnetic Trigger-Interaction between You and the Stunning VR world Through the magnet button, you can easily control games especially cardboard games or apps like fulldive which combies cardbord games with camera and player. You don't need to use an extra controller or taking off the headset. Ultra-light & Three-point Balance Design & Sponge Stuff-Less Pressure to the Nose DESTEK V3 is much lighter. Even with the iPhone5 frame, it is only 284g (10oz); the adjustable strap is three-point balanced and there is sponge stuff for the nose, effectively relieving the burden of your nose. Wide Compatibility & Convenience for use The cradle can be adjusted up & down and left & right, widely compatible most of 4-6 inch smartphones and there is a frame for iPhone 5/5S/SE. The NFC tag can launch the app quickly. You just need to set the app into the NFC tag and then paste it in the right positon . Package V3 Headset,User Manual,Cloth,NFC Tag,thinner Sponge pad Confident to choose DESTEK Strictly quality control in each DESTEK product 1-year warrnty for each item from Thinkline LLC and long-time support from DESTEK forum Friendly & fast customer service within 24 hours Any questions, please don't hesitate to contact us. DESTEK,a blending word of Design and Technology,which comes from imagination and creativity,bringing joy into your life.DESTEK endows products with a sense of design and technical spirit,conveying our pursuit of life. Only care Heath of your eyes DESTEK VR lenses do the least harm to your eyes in the current market with 90° FOV. Bigger fov is harmful for eyes as its distance is too close,and will get dizzy after minutes,DESTEK spend many time to test the better distance for watching 3D movie or play game healthly.Our lenses have reasonable focal length,so no optical lenses adjustment needed. Combo set saves you the cost of buying a Bluetooth controller, supporting IOS(< IOS 9.3) & Android: Game Control ONLY for Android; Player Control for Android & IOS(< IOS 9.3). (PS: NO MAGNET BUTTON on the Headset) Humanized Design ? Humanized material,high quality breathable & comfortable but Non-toxic environmental sponge to protect your face. ? DESTEK uses a magnetic clasp to keep the lid closed. Nice to open and close and quite secure. An additional thiner holding phone sponge pad ia available for thicker phones like Note2/3 etc. ? 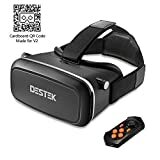 DESTEK 3D VR Headset Derives from Google Cardboard,NO MAGNET BOTTON, but our combo set will come with the remote for you to play games on Android smartphone. Package VR Glasses,NFC,Nose Pads,Cloth,Manual. Confident to select DESTEK: Friendly and fast customer service. 1-year warranty for each DESTEK products sold from Thinkline LLC--the ONLY OWNER of DESTEK Trademark. Your smile is the goal we are pursuing. Instead of money, we care more about your feelings. Please feel free to contact us. DESTEK,a blending word of Design and Technology, comes from imagination and creativity, bringing joy into your life. DESTEK endows products with a sense of design and technical spirit, conveying our pursuit of life. 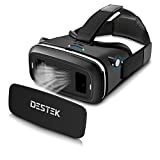 DESTEK V2 VR Headset, your good choice to enjoy immesive VR Movies! Best Movie VR Clear image effect for different people: High-precision lens technic & high-quality lens material and high light-transimission make the image clear, exactly renewing the movie scenes while effectively disspating eye fatigue; the object/pupil distance adjustment make it suitable for different people with clear image Less image noise: The FOV of DESTEK V2 VR Headset is most suitable for movie watching. The proper 83° FOV can make the whole screen brought out with less image noise caused by picture magnifying. Comfortable wearing: The flexible velcro straps and high-quality soft PU facial pad make it cosy to wear. Very suitable for movie watching. Awesome Front Cover Design: DESTEK V2 VR is designed with removable front cover, making it better for heat dissipation while the holes on the cover make it possible for AR or camera shooting purose. Note: This headset is not suitable for users with more than 200° of myopia. PACKAGE: 3D VR Glass, User Manual, Cleaning Cloth, Pads NO NFC tag this time Confident to choose DESTEK: Customers come first with friendly and fast customer service. 12-month warranty for each DESTEK product sold from Thinkline LLC---only OWNER of DESTEK Trademark. Long-time reliable support from DESTEK forum from how to use to what apps are better for use etc. Your smile is the goal we are pursuing. Instead of money, we care more about your feelings. Any questions, please feel free to contact us.